(New York) - The Beijing municipal government should immediately reverse plans to demolish a settlement where up to 4,000 citizens petitioning for official redress of grievances reside, Human Rights Watch said today. The Fengtai District settlement houses some of the tens of thousands of people who travel to the capital every year to lodge petitions with the central authorities in the hope of redressing local corruption and abuses. Human Rights Watch has received reports that official notices of the looming demolition were posted in the settlement in southern Beijing’s Fengtai District on August 30. The notices state that all residents must vacate the area by noon on September 19. The notices provide no information regarding possible compensation or relocation assistance. Chinese law requires property developers, or the government departments acting on their behalf, to approach existing residents at each site, whether homeowner or tenants, to advise them of their eviction and negotiate compensation. China’s petitioning, or xinfang, system dates back thousands of years and is designed to allow ordinary people to raise formal grievances about subjects ranging from police brutality and illegal land seizures to corruption. Official regulations require government petitioning offices to personally interview all petitioners, make a permanent record of the complaint, and resolve it within 60 days. Petitioners are also under threat of harassment and detention by municipal security forces ordered to keep petitioners off the capital’s streets ahead of and during important political events. During the annual session of China’s National People’s Congress in March, more than 700 petitioners in Beijing were detained, many of whom were forcibly sent back to their home provinces. Chinese scholars have documented severe inadequacies in the petitioning system. 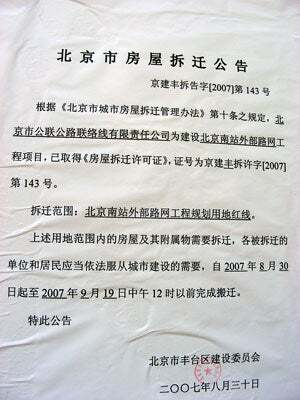 The results of a survey of petitioners to Beijing conducted earlier this year by the Chinese Academy of Social Sciences (CASS), one of the government’s most influential academic think-tanks, indicated that the 2005 Regulations on Letters and Visits, designed to improve the responsiveness of local governments to local grievances and thus help reduce the number of petitioners coming to Beijing, has failed. The CASS survey revealed that 71 percent of petitioners surveyed have been the victims of increased intimidation and retaliation; 64 percent have been detained at some point; and only 5 percent of those surveyed reported that local governments have become more attentive to dispute resolution since the 2005 regulations were enacted. “If a Chinese government survey clearly states that petitioners are being ill-treated and urges local authorities to help resolve their problems, it makes no sense that municipal authorities in Beijing are doing precisely the reverse,” said Richardson. Petitioner activists in the Fengtai District settlement said that the looming demolition will mark the last stage of destruction of the area, which once housed up to 10,000 people before municipal authorities began tearing it down shortly after Beijing won its bid for the 2008 Olympic Games in 2001. The area is under surveillance by up to 200 uniformed and plainclothes policemen and the majority of petitioners living there can’t afford alternative housing if the eviction proceeds, those activists said. Foreign journalists who visit the area are routinely harassed, detained and questioned by police in violation of Olympics-driven temporary regulations granting wider media freedom from January 1, 2007. Although the official notices attribute the timing of the evictions and demolition to planned road construction, it is equally a result of a “clean-up” of the city ahead of the 17th Congress of the Chinese Communist Party in October. The congress, which is held only every five years, is a typically sensitive period for the government because it is the forum in which the next generation of Communist Party leaders will be unveiled. China’s Ministry of Public Security has urged Beijing police to “mobilize all resources” to prevent petitioners from reaching central government offices while petitioners from Hubei province have been specifically warned by government officials to leave the capital ahead of the congress, the South China Morning Post reported in August.